Credit where it's due; some cracking stuff has been uploaded to the Bell St End to Boardroom (BSE2BR) blog in recent weeks. I'd been going to York Road, with my Grandad, since he first took me as a toddler in the early 80s. 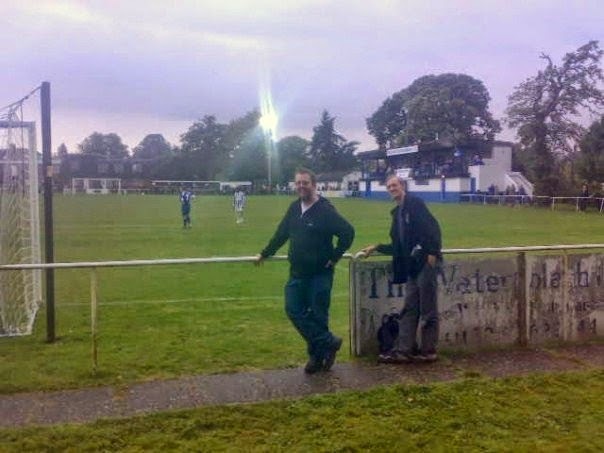 It was the late 90s/ early 00s - when in my late teens/ early twenties - that I began to enjoy going to football for the very reasons that still keep me engrossed to this day. It is probably because we have reached this era* (the 'Born and Bred generation' morphing into the KSG), on BSE2BR, that my interest has been piqued. I spent much of last Saturday morning watching various archive match highlights on YouTube. Nowadays, in the 'digital age', these type of packages are commonplace. 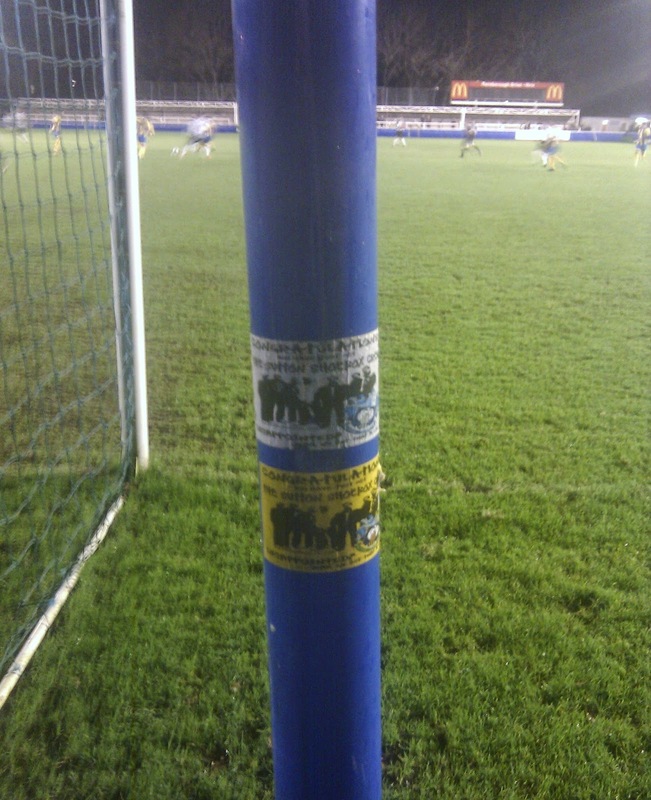 I rarely pay much attention to them - as I find that watching Maidenhead United games just the once, in the flesh, is more than enough - but realise that they can be useful; for double-checking a goal was as good as you initially thought (e.g. Devante McKain @ Dover Athletic during Fancy Dresslemania XII ... and, yes, it was), for truly appreciating a virtuoso individual performance (e.g. Fat Phil Wilson's heroics at Halifax Town** ... with the aid of 'lady luck', it must be said, while Steve Hale's strike was another good 'un), for reviewing game-changing game-ruining refereeing decisions which you missed (e.g. Andy Dugdale's early red card for handball in the FA Trophy QF @ Canvey Island ... no real arguments) and for laughing out loud at 'did that really happen' curios (e.g. a cricket ball on the pitch at Welling United ... superb 'long barrier' fielding technique by Steve 'Barmy Army' Hale, on the touchline, after a loud shout - from Macleod (C) - that the referee should 'stick it up yer arse'). 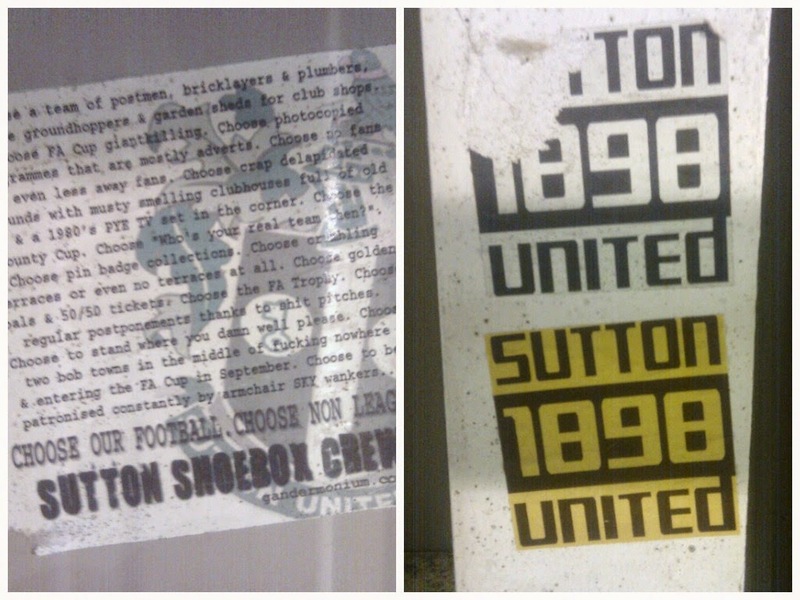 For me, though, these packages don't tell the whole story; the on-pitch action is only part of a day out at football. Also, there's no context. As such, I thought I'd share some other - more alternative - Maidenhead United clips from YouTube, with additional commentary that will hopefully help 'set the scene'. Please feel free to make known any other 'hidden gems', that I've missed, and - if I have the time/ inclination - maybe a follow up post will result. Or maybe not. * A time when Maidenhead United was Maidenhead United, if that makes sense? People will accuse me of 'misty eyed nostalgia'; of having an agenda; of being anti club and anti Drax. Maybe all of that is true (at least to some extent), but there are others that will know exactly what I mean. And who will agree with me. Incidentally, watching John Dreyer's side in action, on YouTube, re-affirms my view that sacking him - let alone appointing Dennis Greene as his replacement - was a terrible mistake. If only Tumble could've persuaded Lawrence Yaku to turn up - and on time - on a more frequent basis. Alas. Before - A narrow 1-0 win over Merthyr Tydfil at York Road had secured our first appearance in the 1st Round of the FA Cup since the 1971/72 season (the Merthyr game was the one after which a pink jumper-wearing skinhead punched Willie T, full in the face, in Stripes ... before being allowed back in for the league fixture only a few weeks later). We were drawn away to higher league opposition and there was much excitement. Pharmalink kindly paid for a number of supporters coaches (five or six?) to the game. A recently-appointed Drax was still in his honeymoon period. Pre match Churchillian speeches, in the pub, preceded red cards for Craig O'Connor and Dominic Sterling; a Chico Ramos penalty save; an heroic 1-1 draw; on-pitch punch-ups with some Stoke City top boys at the final whistle (see Tremendous Mike P for photos of the current MUSA Secretary going toe-to-toe - sort of - with the cap-wearing hoolies). Days like this - also Blyth Spartans (Whitley Bay), Plymouth Parkway and a few others - make me want to find the time for a 'Retrospective Away Day Diary' series! Before - An amazing run of form, after Delroy Preddie kicked a divot vs Wealdstone at Northwood, saw us into the Southern Premier play-offs. 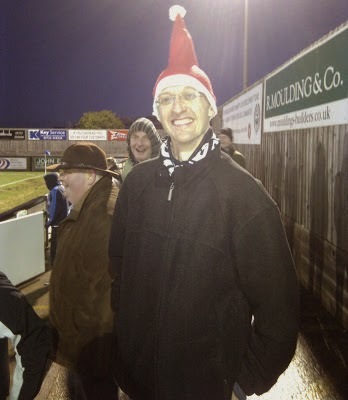 A legendary midweek victory in deepest, darkest Norfolk ('Nisbet scored at King’s Lynn') preceded a relatively comfortable and straightforward 1-0 win, over Team Bath, in the final at Twerton Park. Cue delirious on-pitch celebrations and the iconic image of Macleod (C) giving Bobby 'The Daddy' Behzadi a piggy-back. 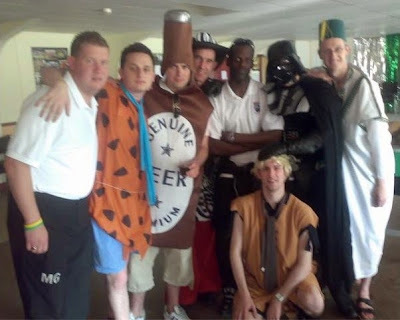 A real sense of togetherness had developed (see photos from that season's Fancy Dresslemania, at Banbury United, for proof; players, management and club officials all posing for photographs with the supporters). The B&B Cup Final took place on a Bank Holiday Monday, just 48 hours after the aforementioned play-off final. As such, players legs were tired and supporters voices were hoarse. Sore heads all round! Probably. We should've won this game, but no-one was too bothered that we didn't. The following video was, believe it or not, captured by an 80s TV superstar … as you can probably tell from the superior production values. The great and the good (and yours truly) can all be spotted: Club Shop Guy, Rainey, Rasher, Dickie West, my Mum and Dad, Educated Left Foot; interviews with The Daddy, the manager and Yashwa Romeo before the end. Macleod (M) can be heard throughout, meanwhile, leading us through an array of chants (incl. 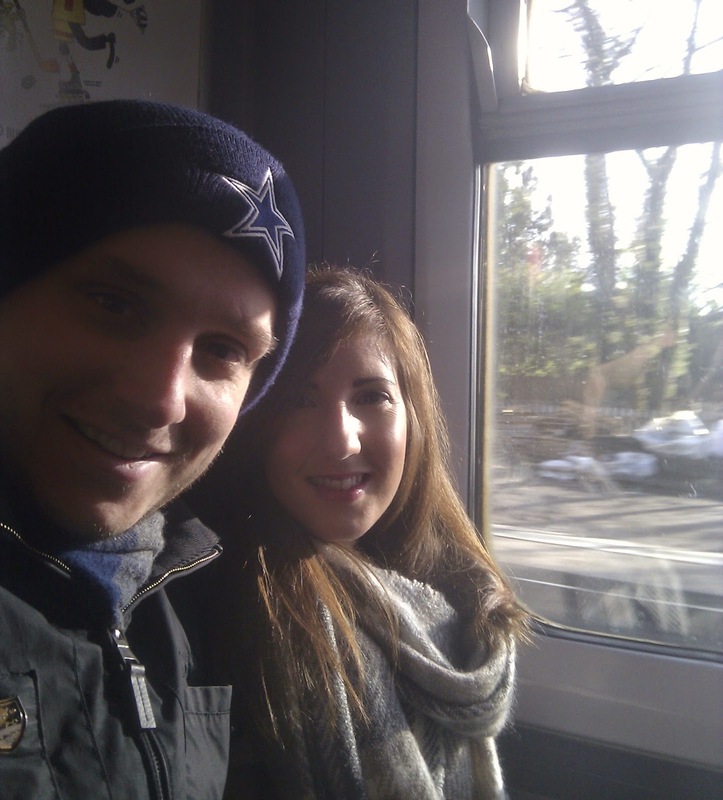 'Berks & Bucks; w@nk, w@nk, w@nk'). An enjoyable conclusion (result aside ... but who cares about the county cup??) to an enjoyable season. 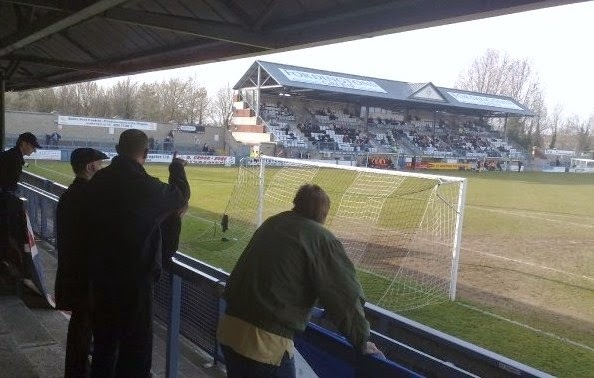 After - I've written previously, on here, that the display against King's Lynn in the play-offs is the best I've seen from a Maidenhead United side. All that squad needed, IMO, in order to compete - if not thrive - in the Conference South was an out-and-out goalscorer. As it happens, we (inadvertently) got one: Emmanuel Williams. The story goes that Manny - who knew Drax from their (not altogether fruitful?) time at Yeading - asked to train with the club, ended up signing, and banged in 30 goals in 47 games (Nb. 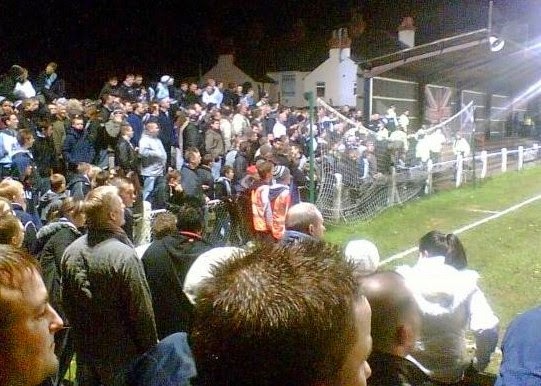 the 'SuperManny Williams' chant was first heard, on a rainy afternoon in September 2007, during a 6-0 FA Cup win at Brockenhurst). Regrettably, the unnecessary dismantling - of the both team and, ultimately, the aforementioned spirit of togetherness - was underway: Louis Wells was signed to replace Chico, a transfer fee was paid for Wes Daly, Dominic Sterling was shunted to left back, Dwane Lee played where he liked, Carl Wilson-Denis started upfront, The Daddy seriously injured his knee (vs HAYU in the FA Cup) and would infrequently play centre mid again. I could go on. Instead, one word: Horsham. Before - Many of us (incl. 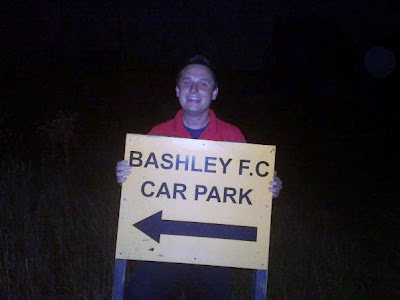 yours truly) celebrated when we were drawn against Horsham. And why not? They were a lower league team. I remember that their supporters got the arse about that. Bell ends. Anyway, we travelled in (relatively) huge numbers - the KSG's spiritual leader coming all the way from Turkey! - and the pub directly opposite their ground (the Queen's Head?) 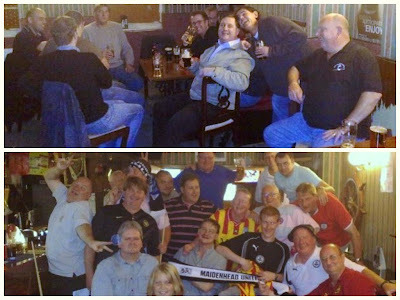 was spilling over, pre-kick off, with Maidonians. You could barely get through the doors and so the KSG went to the off-licence across the road and came back with a crate of lagers to drink outside! Memorably, an old boy showing off in his classic Ferrari convertible was left as red-faced as his car when it conked out - loudly and seemingly in slow motion - as he drove past the throng. Superb! They say that 'history is written by the victors' and that rings true; all the post match reports - in print and on TV - highlighted 'a tremendous 35-yard effort' from Nigel Brake to open the scoring but, for me, Wells really shouldn't have been beaten from there (I'm sure that the BBC Radio Norfolk commentator would agree with me that Chico - on the bench at Horsham - would've saved it). Furthermore, while the 3,379 attendance was certainly impressive, it goes unrecorded that the sizeable away support made much of the noise. Bitterly disappointing, therefore, that the performance from Drax's boyz was so lifeless. Painful to recall, actually, even to this day. The following video, however, cheers me somewhat; the rather desperate cry of 'come on', that can be heard at the very start, is very likely me ... despite the fact that, by design, I had recently positioned myself towards the back of the stand. It was rather obvious, you see, that if Dwane Lee's penalty went in there would be a surge forward as part of wild - and rather relieved - goal celebrations. Others - e.g. the Macleods - recognised the same. Steve H - for one - didn't and he was left writhing in agony, on the ground, as the rest of us sensed hope (after halving the deficit). 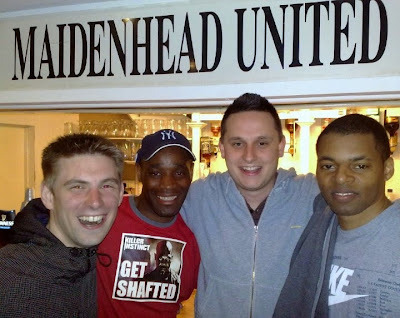 After - Steve H recovered, but Maidenhead didn't. 4-1 the final score. A deserved defeat. Capitulation. Humiliation. Drax's reputation irrevocably damaged. For me, things have never been the same. Horsham played Swansea City in the next round, losing 6-2 in a replay (both games televised?). The Swans would then lose to Havant & Waterlooville, who in turn lost - famously - at Anfield (with Richard Pacquette on the score sheet and Rocky Baptiste also in the starting XI). The day after the aforementioned 6-2 game, we lost 4-1 in the B&B Cup at MK Franchise Dons (263 witnessing a masterclass from Bally Smart and a quite remarkable consolation strike from Darti 'hold me back' Brown). 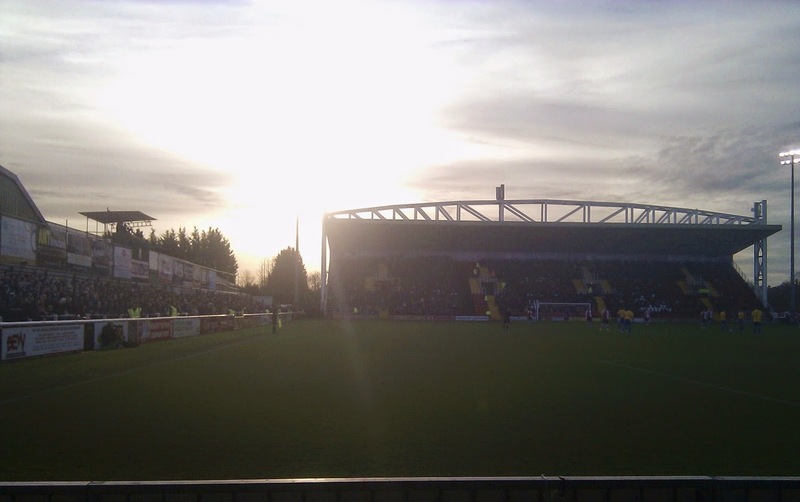 We would then exit the FA Trophy, at AFC Wimbledon, in our very next match. Season effectively over at the turn of the year. Sound familiar? Six consecutive league defeats, in springtime, saw us seriously flirt with relegation; eventually finishing 17th after an unbeaten end to the season. This was no doubt celebrated as a 'great achievement'. Again, sound familiar? 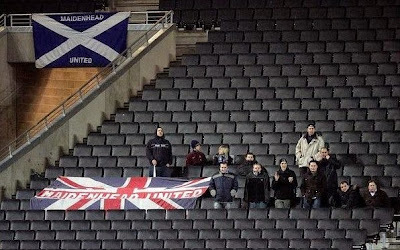 Before - The other night, prior to the Cambridge United vs Manchester United game in the FA Cup, I heard the home side's CEO - Jez George - comment in a radio interview that the football club is all about 'the fans and the youth academy'. Amen, brother! Time, now, for an ode to one of Maidenhead United's bona fide 'real' fans. 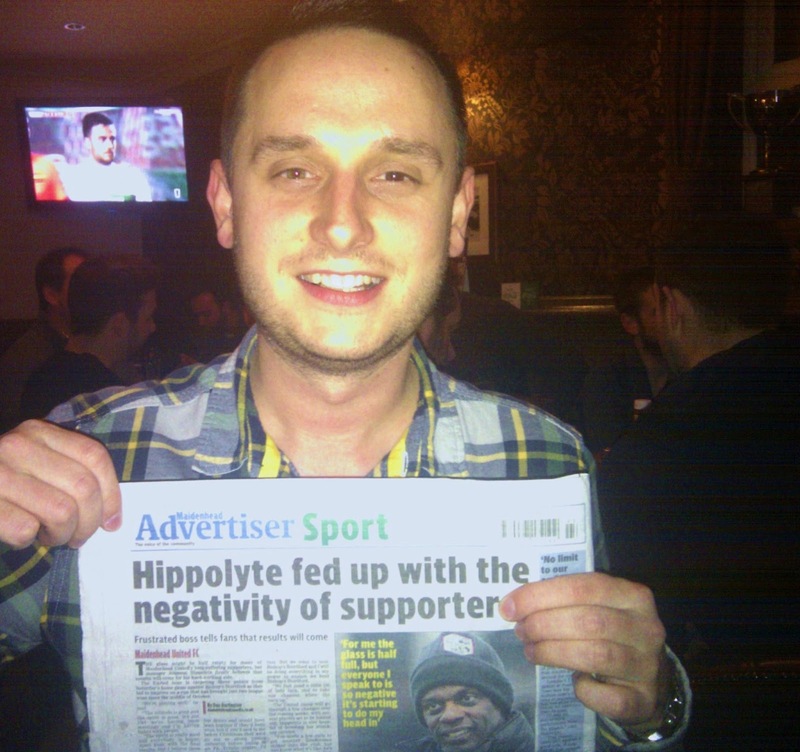 Bobby P - aka Pintjoy; Rant Zone - is one of those who transcends both the 'Born & Bred generation' and the KSG. After - The Anchor was a sh!thole, for sure, but it was our sh!thole. 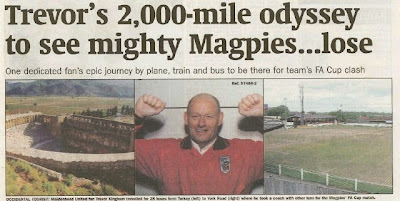 The story of Merthyr Tydfil fans - the majority of whom were presumably residents of the reigning 3rd worst place to live in the UK - refusing to go in because it looked 'too rough', is oft repeated to this day (#whatwouldmerthyrdo?). As aforementioned, Saturday nights in there, post match, were - for a time - really rather brilliant; continuous football matches on the various TVs, 80s music (Collins, Wham, John etc.) on the jukebox, football scarves on the wall, loads of family and friends discussing the game (and likely moaning about Drax; I remember a straw poll, after a 1-1 draw with Sutton in December 2007, that resoundingly concluded he should be sacked). Admittedly, not all of the comment was as well-informed and life-affirming as the Rant Zone interviews. But still. It was a sad day when, last February, property developer Michael Shanly made Landlord Joe an offer he couldn't refuse (not like that) for the last piece of Maidenhead that he didn't own (well, almost). The Anchor remains open but the scarves are gone and, despite much-needed new seating (plus the fact that the wife will now go in there, when she wouldn't before), it is best avoided. As such, if you wanted some post match words of wisdom from Bobby P, these days, then you might have to try Stripes(!). Or the Greyhound. Or the Bell. Or Bar Sport. Or the Rose. Who knows? Actually, it was in the latter where Macleod (M) and I whiled away a Saturday night, with the man himself, in early December. The usual topics were discussed - and sparks flew, at times, for sure - but it was an enjoyable evening. 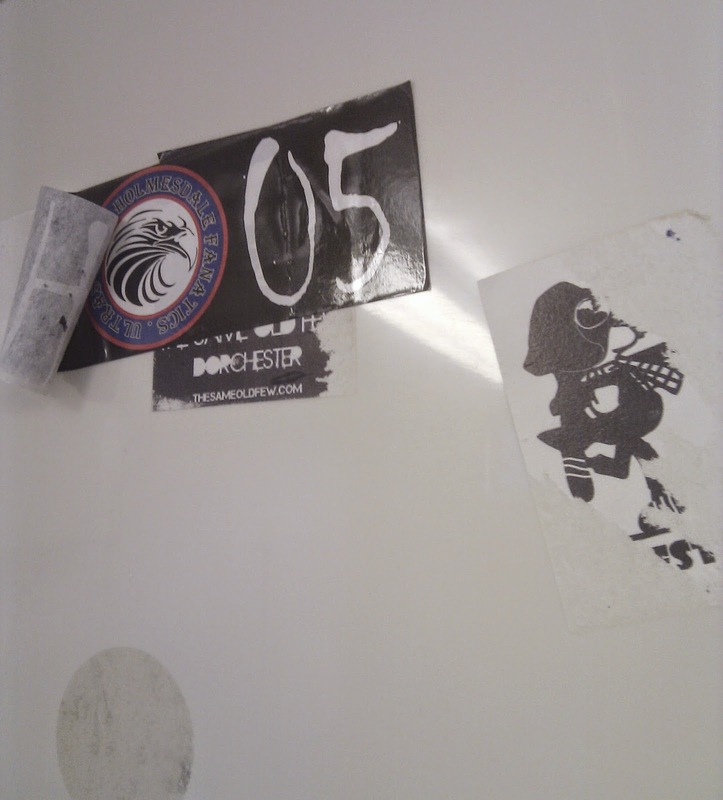 His tale of the team coach journey down to Whitehawk, earlier this season, certainly raised a few eyebrows! Would Lawrence Yaku, for example, refuse to travel on the team coach and instead drive behind, in his Chelsea tractor, with the manager - John Dreyer - in the passenger seat? Perhaps he should've! Anyway, my Facebook timeline was awash, last Saturday night, with status updates - and photo uploads - relating to the fact that the Wealdstone Raider was making a public appearance in Bar Sport, Maidenhead. Remarkable to think of the Raider's success; basically ripping off Bobby P's shtick … without the nuances, thus appealing to the LAD bible masses. Joking aside, much of the money he's raised has been donated to charity and so good luck to him. In a parallel universe, however, Bobby P was entertaining a load of Saturday night revellers in a north west London sports bar. Hey ho … that's more than enough quantum theory for one post! 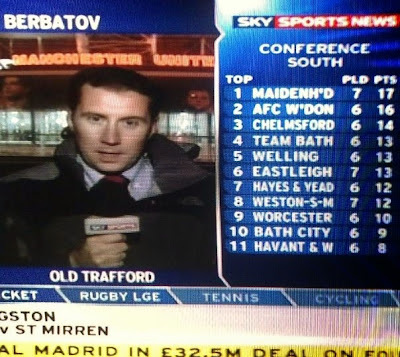 Before - The Magpies had topped the table early on in the 2008/09 season but our seating shortage meant play-off participation wasn't possible and, in any case, we fell off the pace after our (presumably sizeable) budget was slashed in the new year. Whispers of Rocky Baptiste's signing emerged at Bashley, in September, as we were dumped outta the FA Cup by a side struggling in the division below. He would supplement a group of strikers that already included Richard Pacquette, Lee Newman, Gavin James and Mustafa Tiryaki. Manny Williams, meanwhile, would later re-join on loan from Woking. An embarrassment of riches that saw James and Tiryaki farmed out on loan, the latter to Potter's Bar and then Godalming. The relatively high-profile Baptiste was clearly past his best, but reputedly commanded more-than-decent wages ... which his cumbersome displays definitely didn't warrant; some of his misses had to be seen to be believed! With Drax bemoaning 'financial constraints' - as Dale Binns was sold to Hayes & Yeading and Pacquette went on loan to Histon - the long suffering York Road faithful had to endure rather more of Baptiste than they would've liked. Drax - in typical fashion - was quoted in the Advertiser as saying that, during training sessions, Rocky resembled Dimitar Berbatov. It was meant as a compliment. Hungry youngsters like James and Tiryaki were the future, though, we could see this. 'We', at the time, included a group of 30-odd youngsters - presumably encouraged to attend by the admirably low £1 entry fee for kids - who were loud and witty with their chanting; inspiring the KSG (sans Macleod (M) ... still on self-imposed exile following his ban, post Cirencester?) and making meaningless York Road fixtures significantly more entertaining than they otherwise might've been. 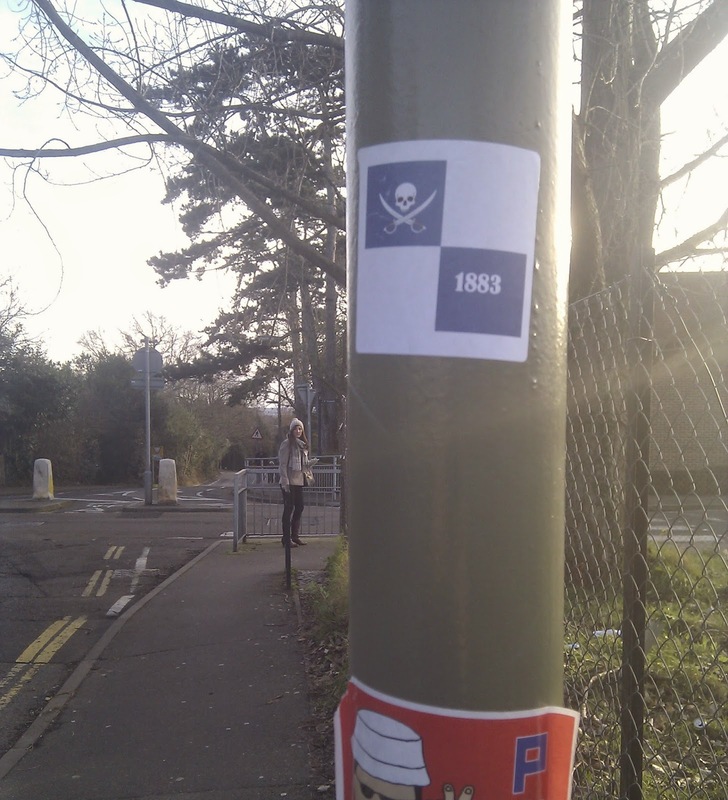 The 1-1 draw with Thurrock on 3rd March was one such occasion; 186 people - incl. four vociferous away fans - generating a far superior atmosphere to anything I've experienced at York Road more recently, despite average attendances now topping 400. The video below is, sadly, only two seconds long but certainly one of my favourite clips on YouTube. Baptiste wallops a free kick into the stratosphere - the ball now circles Jupiter alongside the one that Chris Waddle spanked over the bar during the penalty shoot out with West Germany in Italia 90 - and the crowd falls about laughing. I love the horn sounding (Nb. you might actually have to view on YouTube for this); like something you'd hear at a circus! After - Rocky would actually be substituted - to loud cheers - before play was re-started with the goal kick! Comedy gold. By the end of the month he was gone for good, signing for AFC Wimbledon and scoring(!) in his one and only game en route to the Conference South title. He joined Harrow Borough next and, according to Wiki, scored 50 goals in 76 games for them ... but is perhaps best remembered for an extraordinary miss that has been viewed, on YouTube, more than 4.6 MILLION times! Baptiste's belated departure reopened the door for Gavin James and GJ showed promise, upon his return to the team, before an horrific double leg break at Dorchester Town. He was out for a considerable time and now plays for Flackwell Heath. With Rocky gone and GJ sadly crocked, it was left to Tiryaki to fire us to our highest ever league finish (#spin). The previously unheralded Turk quickly formed a near unplayable partnership with the returning Pacquette and scored seven goals in seven games as the Magpies ended the campaign in sixth. This earned him a summer move to Havant & Waterlooville (and Drax claimed him as another 'find'; the reality being that the manager didn't play him until the budget cuts meant he more-or-less had to). I'd have liked Bristol Rovers to sign him, thereafter, to replace Rickie Lambert but instead he had (admittedly goal shy) spells at Tranmere Rovers and Cambridge United before moving back to Turkey. He now plays for Göztepe SK. The 30-odd youngsters who helped make home games good fun for a time? Only a handful remain. Why not more? I don't know; you'd have to ask them. But put it this way, if the likes of Macleod (M) and the rest of the 'Born & Bred generation' weren't about during my formative years then I wouldn't be writing this! 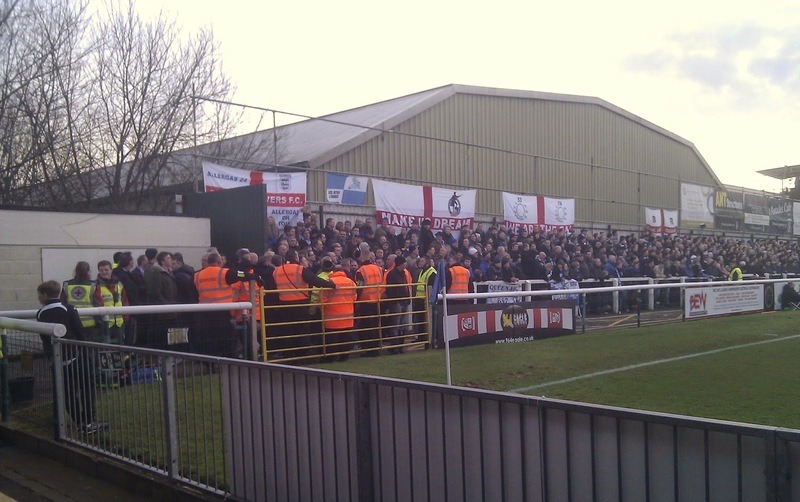 (#blamemurdo) As mentioned in a recent post on here, there is now another group of vocal youngsters to be heard at Maidenhead home games. Will they be encouraged to last longer? Don't hold your breath. While the Shots were losing 1-0 to the Owls in the next round of the Cup, the Berkshire Magpies were losing 1-0 at home to the Dorset Magpies in the Conference South. We wouldn't win another league game until beating Salisbury on 17th December. I enjoyed our time in here - Brains is fast becoming a brewery of choice; whilst we had an ideal spot for watching the world go by watching a twenty-something bloke spend an eternity eating a KFC as his mate stuffed Argos catalogues into plastic bags in the boot of their parked car - but, after an hour or so and a couple of rounds, it was time to embark on the 20 min walk, back past the station (and a couple of lampposts, newly plastered with Rovers stickers), to the ground. 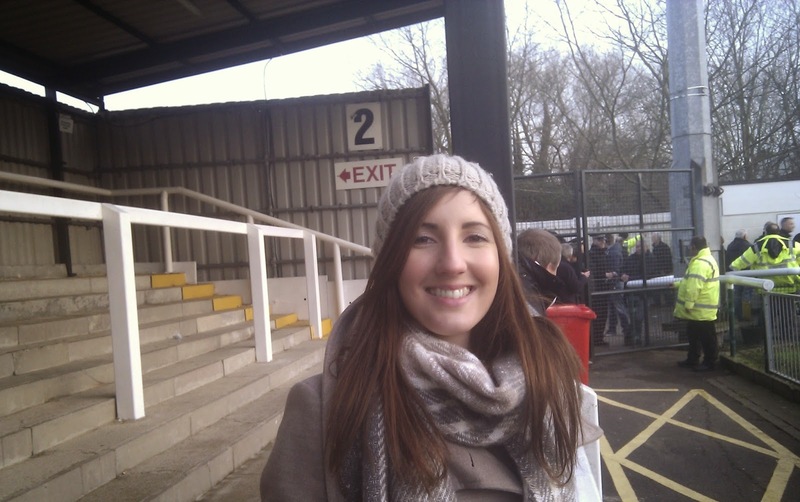 I'd previously been to the Kingfield Stadium to see Maidenhead play (and so did wonder where all the away fans were gonna go! ), but travelled by car on that occasion. The route on foot was simple enough, however, and - despite being slowed somewhat by mud in around and the nearby park - we arrived in good time. Mrs Goggins ticked our names off the guest list and we were in. We would be stationed in the home end; the covered terrace behind the goal. We were, after all, £30 better off thanks to the generosity of a Woking employee. The travelling hordes were stood to our immediate left (on the uncovered terrace) and seated opposite (in an allocated section of the impressive main stand). While those denied entry were hanging around outside or being talked at - and photographed with - Willie, in a nearby boozer, there was plenty of room in the home end. More so, in the second half, as many of the Cards fans moved to be nearer the goal that their team was attacking. 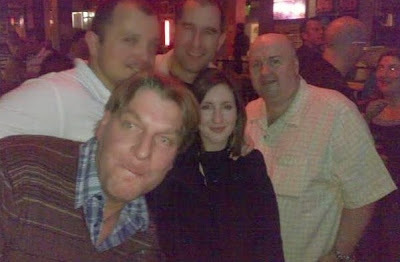 The group of middle-aged men, behind us, didn't move. Lamentably. Now, I'm someone who has previously been reprimanded for swearing (or allegedly swearing) at football - and I will defend the right of adults to use swear words (as a form of expression) at football grounds, in pubs, after the watershed on TV etc. - but the language from these blokes was, quite frankly, embarrassingly pathetic. 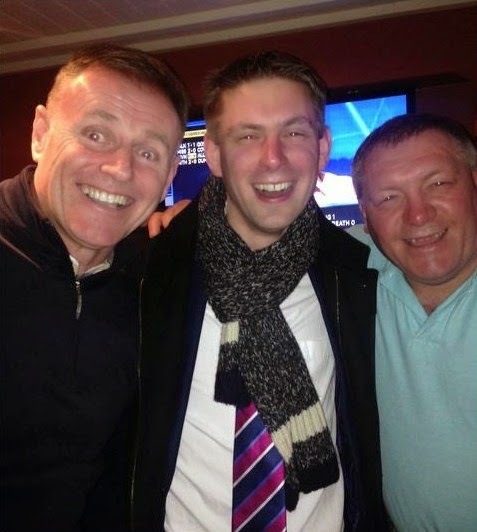 The linesman was a 'faacking caant'; the Rovers fans were 'faacking mugs' who should 'jog the faack on'. 'Faack this'. 'Faack that'. Faacking tedious. Particularly as they were, quite evidently, more interested in the Chelsea game: 'Cahill has started', 'Costa has scored', 'Fabregas has another assist', 'Willian has hit the post', 'Swansea have a throw-in' etc., etc. A couple of them left before the end. One - a Scot - resembled a balding, grey-haired Liam Gallagher; glaring at the (impeccably behaved) away support before swaggering off. 'His missus is expecting him home, sharpish, to finish the weekly chores and babysit the grandkids,' reckoned the wife. More than likely. It was something of a relief - as the temperature continued to plummet - when the final whistle sounded. 'Thank goodness we didn't have to pay to watch that'. We met up with Willie, outside the ground, and then spent much of the next hour trying to get out of the adjacent leisure centre car park (trust Willie to move his car there!). At least I had the time to catch up with goings on at York Road (TBF, when Drax said recently that the 'results will come,' he didn't specify when!) 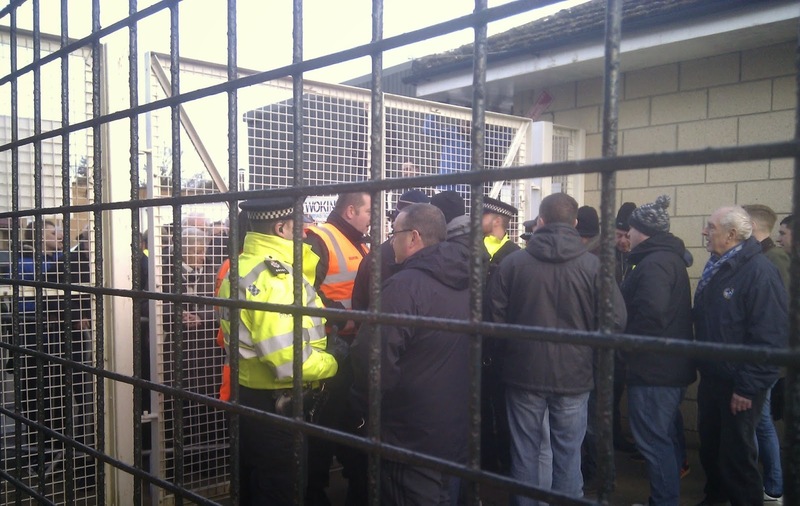 and the fallout from the Rovers contingent - now thought to total 200 - being locked out. A Woking spokesperson initially stated that Rovers had declined an offer to make the game all-ticket, but this has since been corrected. I've also read reports that the stewards OR the police (opinions vary) offered to form a human barrier in order to let the Rovers fans onto a hastily-segregated covered terrace. The 'other' group of fluorescent-jacketed jobsworths apparently declined. 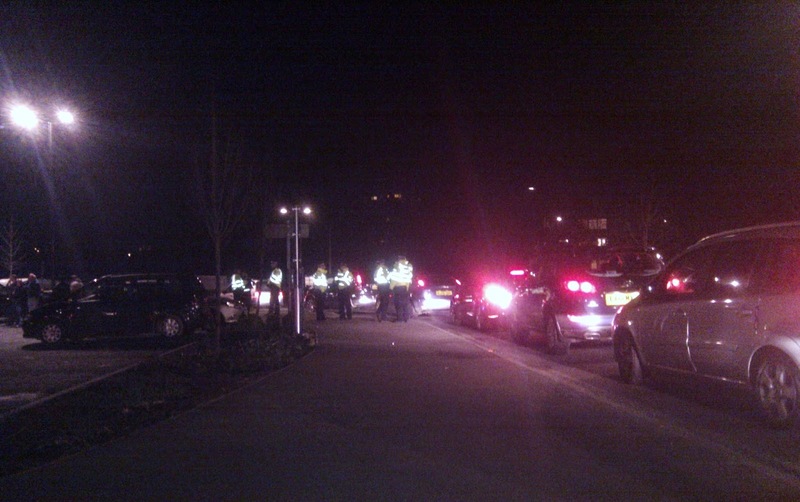 I very much doubt that it was the police being proactive in trying to help … not if the 11 (ELEVEN) who were stood in the car park, doing bu88er all, were any indication! Further reading HERE. Oh, and buy THIS book. Ta.